We finally did it. We've had Impetuous for over a year now and last week while sailing across Matagorda Bay WE HOISTED THE KITE!!! File comment: Isn't that pretty? As long as we're showing pictures. What is this? I've been hauling this around for a few years thinking I had an asymmetrical in the bag. It goes up with a sock, and when I first popped it I was surprised that it is cut more like a light weight 130 genoa. Maybe it's a gennaker, it points pretty well. Does anyone have any pictures of how their crusing chute's tack is connected to around the forestay / furled headsail and to the boat? I put my cruising chute up for the first time last year and made it work, but I doubt I set it up correctly. I recall there being pressure on the bow pulpit which I didn't care for. If anyone knows of a picture, a thread, or another website, I would appreciate it. 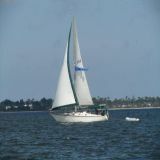 A typical arrangement is add a short pennant to the tack of the sail and attach the pennant on deck. The tack can be set high enough (a foot or so) so most of the reinforced corner of the tack will be above the pulpit. The pennant would allow the tack to swing around quite a bit, so usually there is also a 'cumberbun' band that wraps around the furled jib and clips onto the tack to hold it to the forestay. Once the tack is secured in this manner, tack can still swing a bit, but there should be little contact between the sail and pulpit. If this doesn't help, you might try capturing an image of this area and posting it for more input. We use an ATN Tacker on Betty Lou. Works great! Jay - yes, the image you provided in the link looks just like the 'cumberbun' I was trying to describe, along with the pennant on deck. We run the tack line under the anchor roller, wrap it around the capstan and then to the bow cleat. Gets it out further forward, you can pull the tack down easily with capstan, works great.